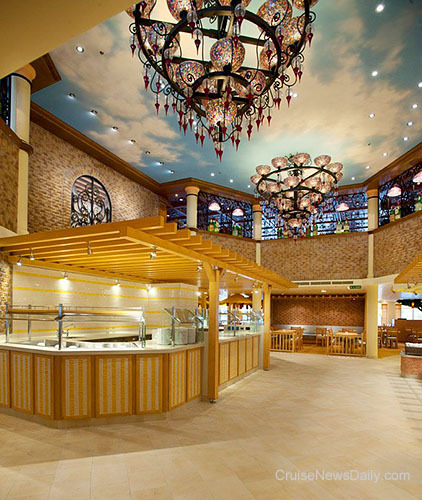 Grandeur of the Seas is the latest Royal Caribbean ship to emerge from a $48 million revitalization. The work was done last month at the Navantia Shipyard in Cadiz (Spain). 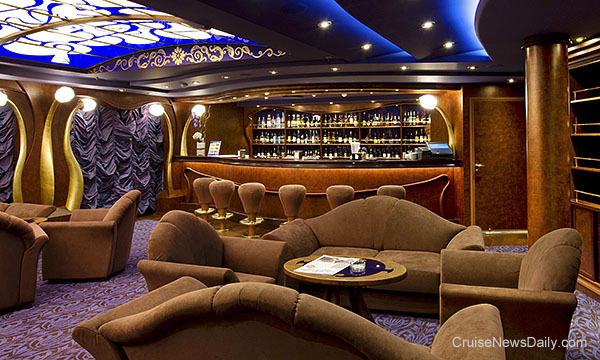 New additions to the ship include five new dining venues, a Royal Babies and Tots Nursery, a transformed Viking Crown Lounge and new aerial entertainment in the Centrum. New York City rolled out the welcome mat as only they can for Disney Magic's maiden arrival in the Big Apple. The ship's arrival (with the world's largest bumper sticker) marks the beginning of Disney's first-ever series of cruise from New York. Carnival Breeze was delivered to Carnival today, and while it's a sister to Carnival Dream and Carnival Magic, it's not a clone. It has some major new features, but the most notable difference is the interior decor. 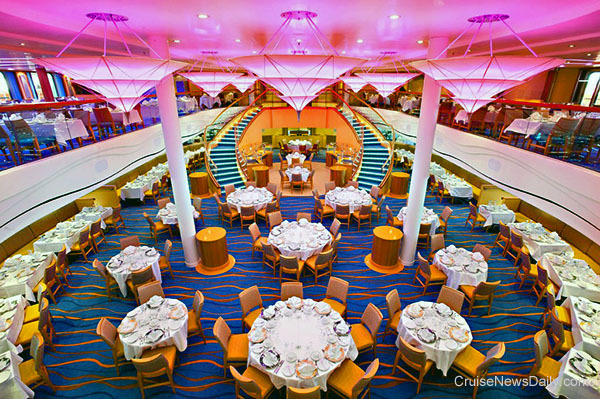 Carnival Breeze has taken on more the look and feel of a tropical resort hotel as can be seen in the photos below. Norwegian Cruise Line has added ten private cabanas to their private Bahamian island, Great Stirrup Cay. 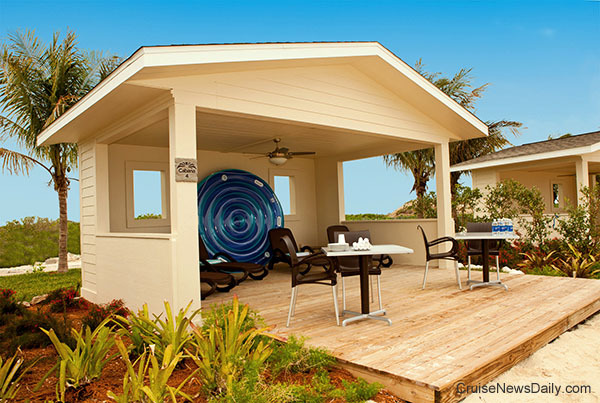 The "Cabanas on the Cay" accommodate up to six and come equipped with lounge chairs, tables, cooler, beach towels and a shower. The $249 price includes priority tender tickets, six bottles of water, a fruit basket, six all-day passes to the Hippo Waterslide (a $120 value), one large float (a $25 value) to use while on the island and a $50 food and beverage credit. Guests in the cabanas have access to an exclusive menu of snacks and beverage packages. The $50 credit may be used toward these or individual beverages at any bar. 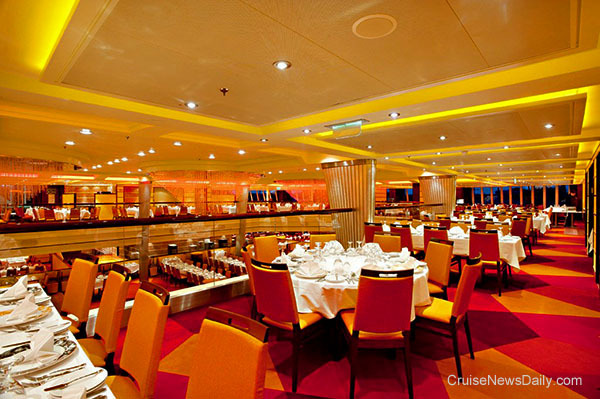 The "Cabanas on the Cay" should be reserved through NCL.com as a shore excursion. 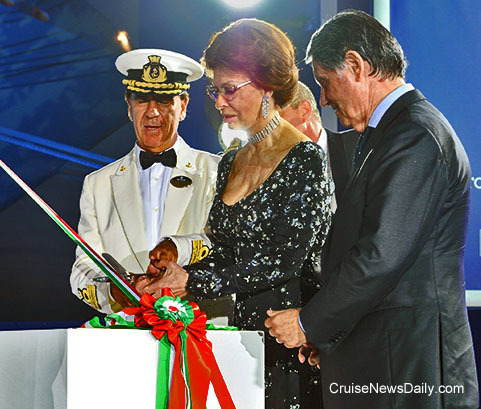 MSC Divina was christened by her godmother, the legendary Sophia Loren, in Marseille on Saturday night (May 26, 2012). 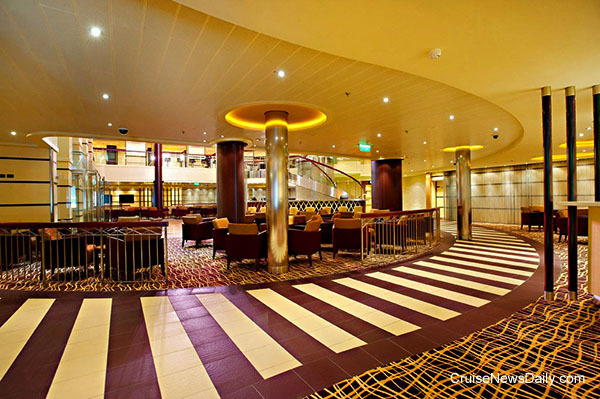 The ship is getting more attention than normal from American cruisers since the ship will be MSC's first ship beyond 100,000 tons in the Caribbean (139,400 grt - about 50% larger than MSC Poesia, which is currently operating in the Caribbean during the winter months). 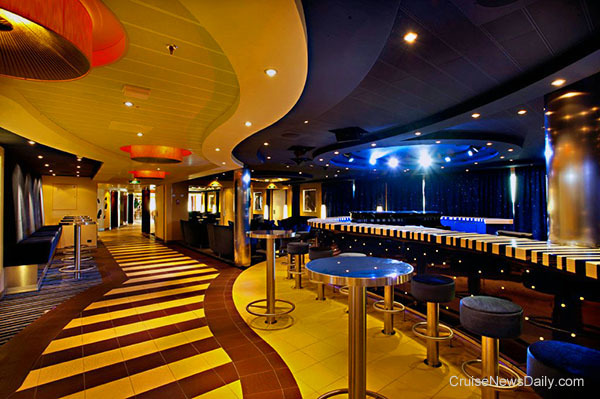 MSC Divina will arrive for her first Caribbean season during the winter of 2013-2014. Here Sophia Loren cuts the ribbon which releases the bottle against the bow. 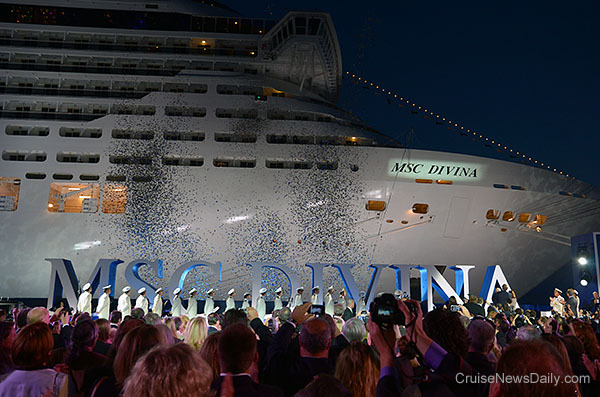 In the photo below, the naming party can be seen on stage (lower right) along with MSC Divina's officers, just after the bottle breaks and a shower of confetti rains down on the crowd. 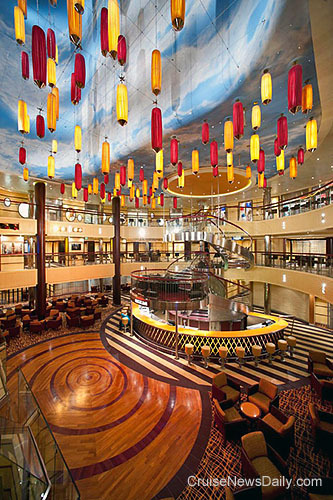 MSC Divina is going to be a standout in the Caribbean (and everywhere else she sails). 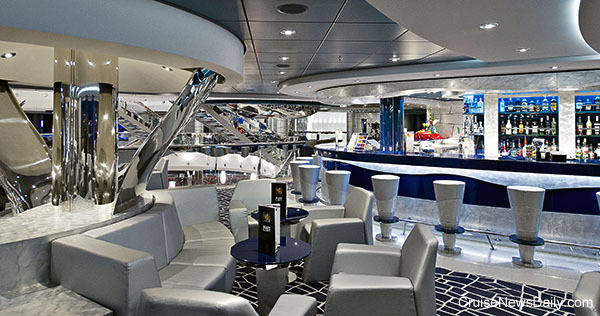 We've selected a couple photos (below) of her interior to show her sleek and stylish, modern European interiors.